• wltjr added a comment to T6221: elm_code does not scroll on select of long lines. • wltjr added a comment to T6224: Disable auto-save turned on by default in EDI or use history vs auto-save. SCM vs VC etc does not matter to me. It is just an example of how things can be confusing or misinterpreted. Why you should ask vs assume.... There are numerous words that have a British and US spelling, much less other stuff. Some of typos come out of frustration. These are bug reports not essasys... Having lost hours this morning to stupid comments on non technical issues. Complete waste of everyone's time. Why it should never have taken place. My comments never editted, none of this would exist. For the record I have none of these problems with non English speakers.... They tend to have really bad English writing skills. Worry about the issues not the wording. There is no perfect communication. The focus should be on getting stuff done. Not the process. There is a reason its called work and not play. Not everything is nice or friendly. That is not the point. Look this was a notes file on my desktop. Minor issues I noticed in my eminence theme. That kind of stuff is not worth being in VC. At best maybe open issues to track stuff that needed to be done. Not every text file or other file need be in VC. • wltjr edited the content of Efl Apps Todo. • wltjr created T6229: EFL / Elementary Print Dialog aka elm_print_dialog. You all need to change how you conduct yourself. Which it is not my place to comment on how you all conduct yourself but since your comment on my conduct. Your pointing fingers so I will point back. • wltjr added a comment to T6153: e22 beta screen flickering and other odd issues. I am not getting any crashdump files, not sure why. I have things built with symbols, and I can attach via gdb I believe. I am not running systemd, but do have elogind. I have had them before. I deleted the file so that it would be a clean output next time. Thus far on neither desktop nor laptop has the file been re-created after delete. You need to stop, Short on Luck, Sorry out of Luck, etc is NOT abrasive. You need to stop preaching to others. Not everyone shares your view or opinion. Thus you should keep it to yourself. You are just creating needless noise. Work the bug, who cares on the text or wording... Seriously! Numerous people have such problem with Intellij and also in [Android Studio](). 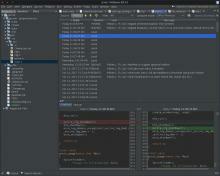 However latest releases of Android Studio it is not set to autosave, normally but still does in some other cases. • wltjr added a comment to T6208: _native_bind_cb() eglCreateImage() for Pixmap 0x0xe325d6 failed:. Ah video ram, possible. Though it happens on both systems. Does not seem to effect anything. Nothing visible on screen, just spits stuff out in session log. Sorry for leaving out relevant information. SOL is a common acronym. You need to understand people communicate differently. You need to stop trying to correct others. It is NOT your place. Who do you think you are? Do you walk up to people in normal life and make such comments? You also assumed it meant something other than it did. A simple google would show you the MANY polite meanings of SOL. Things can be interpreted a multitude of ways. Stop trying to enforce your personal opinions on others. Do you not have anything better to do with your time or life? Have kids if you want to control how people are, what they say and do. Good luck with that! • wltjr added a comment to T6223: elm_code entry area does not fill entire width. I can replicate in everything except elm_tests. Its there in edi and ecrire. It has nothing to do with the document or amount of lines. It is there with 1 line, just not as visible thus I made more lines so the black would be more visible. • wltjr added a comment to T6222: e 22 beta freezing on Take Screenshot. I accidentally took a "Shot"(Take Shot) of a window and that worked fine. Its just the main E menu "Take Screenshot" which causes issue. Locks up E.
I am aware it is in settings. I was using it as a straight editor. To be honest only using EDI so ecrire code is not blamed for elm_code issues. Herald assigned T6227: e22 _pulse_connect() Could not connect to pulse to zmike. Herald assigned T6226: e lock screen does not accept valid password to zmike. • wltjr created T6225: Cannot find description "shaded" in part "e.text.title" from group "e/widgets/border/default/border". • wltjr created T6224: Disable auto-save turned on by default in EDI or use history vs auto-save. • wltjr created T6223: elm_code entry area does not fill entire width. Herald assigned T6222: e 22 beta freezing on Take Screenshot to zmike. You should spend more time coding and less time worry about the words others use seriously! The text you removed does not stand for what you ASSUMED it does... Stop trying to control others! • wltjr created T6221: elm_code does not scroll on select of long lines. • wltjr created T6220: Cannot find description "pressed" in part "base" from group "elm/button/base/hoversel_vertical_entry/default". • wltjr renamed T6219: Cannot find description "visible" in part "base" from group "elm/hover/base/main_menu_submenu/default" from efl_ui_focus_manager.c:153 node_get() Focusable Elm.Box) not registered in manager to Cannot find description "visible" in part "base" from group "elm/hover/base/main_menu_submenu/default". • wltjr added a comment to T6219: Cannot find description "visible" in part "base" from group "elm/hover/base/main_menu_submenu/default". Looking at the default theme, there is no "visible" description in part "base" in group "elm/hover/base/main_menu_submenu/default". Actually not a shutdown issue and is very strange. For some reason that is being triggered at other times. Like when interacting with the main menu. Which I recently added to ecrire so this could be a main menu specific bug. It may also be theme related as I do get another. • wltjr created T6219: Cannot find description "visible" in part "base" from group "elm/hover/base/main_menu_submenu/default". Very unlikely oom, most my systems have it to spare at all times. I haven't been able to max out ram outside of an unwanted runaway process maxing out both cpu and ram requiring hard reboot. Which never occurs when those errors are generated. They seem to get generated pretty often. Multiple times under most GTK apps. • wltjr created T6213: elm_code cursor on top of main menu submenu items. • wltjr added a comment to T6210: e 22+ meson: Program "/usr/sbin/sleep.sh" not found or not executable. Herald assigned T6210: e 22+ meson: Program "/usr/sbin/sleep.sh" not found or not executable to zmike. • wltjr created T6209: elm_code severe lag when selecting text in some files. • wltjr edited projects for T6208: _native_bind_cb() eglCreateImage() for Pixmap 0x0xe325d6 failed:, added: efl; removed enlightenment-git. Herald assigned T6208: _native_bind_cb() eglCreateImage() for Pixmap 0x0xe325d6 failed: to zmike. E depends on libreoffice? That seems odd. Maybe that should be configurable? Unless I missed an option and it defaulted on. The reason I say EFM vs E is windows remain. Open terminals, browser etc. Those never flicker or change. The borders remain, window controls etc. It is only the desktop that seems to crash/restart. Which I thought was handled by EFM. Either way it seems to just be crashing the desktop not E. Thus no e-crashdump.txt or anything beyond what shows in log. Which almost seems like a restart vs crash. The PAUSE bit is strange. That is what I get when it restarts. I have no idea about soffice, or what package provides that. Looking into that part. • wltjr added a comment to T6146: e 22 beta E restart/refresh desktop/efm on unknown file type. Also running into this when I go over Development or Graphics in the main menu. It makes the background, and all icons disappear and then come back. Black desktop screen. But windows all remain visible. • wltjr created T6207: Lots of error messages relating to edje recursion limit of 64. I do not believe these are driver or effects related at all. Right now if I go over Development or Graphics categories in the main menu. It seems to crash EFM. I lose desktop background, icons, and it seems to restart that. Here is my session log file. • wltjr added a comment to T6145: terminology + efl 1.20. * = 100% CPU at times, and locking up E, eventual crash. I have not experienced this since Oct 5th. I have upgrade xorg since then from 1.19.3 to 1.19.4, along with drivers. Not sure if the problem was in that. Going back to e 22 from git to see about other bugs. But seemed this was more EFL than e, as I recall running into this long before e 0.22.0 alpha or beta. 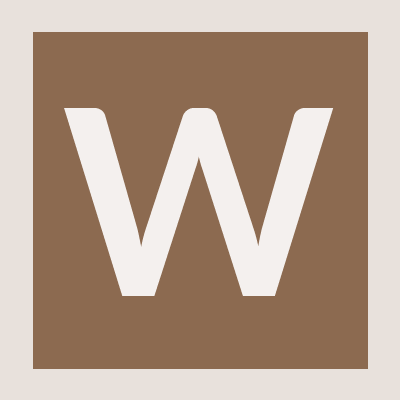 • wltjr added a comment to T6144: E 22 alpha and beta GTK stops rendering internal content. I have to install e 22 again. I switched both my laptop and desktop back to 0.21.9 due to various issues. I can see about another attempt. This time from git. I will have to replicate and provide such. Herald assigned T6153: e22 beta screen flickering and other odd issues to zmike. This has happened 3 times since. After the 2nd time I rebooted my entire machine. It just happened again with 10 terminals in under 30 minutes. Rather than rolling back EFL and E. I will likely install and switch to another terminal. Since I am not running anything other than Terminology. Sometimes I can catch it in time as I did twice. The 3rd time happened so fast. Before I could even ssh into my desktop from laptop it had crashed E.
This happens daily, if not several times a day. It just happened now with 16 terminology windows. I closed 11 of them and it recovered. No other apps open or running. EFL 1.20.4, Termonlogy 1.1.1, E 0.22.0 beta. • wltjr added a comment to T6147: EFL focus issues with elm_win_inwin and/or elm_fileselector. The code is pretty straight forward. • wltjr created T6147: EFL focus issues with elm_win_inwin and/or elm_fileselector. Herald assigned T6146: e 22 beta E restart/refresh desktop/efm on unknown file type to zmike. • wltjr created T6145: terminology + efl 1.20. * = 100% CPU at times, and locking up E, eventual crash. Herald assigned T6144: E 22 alpha and beta GTK stops rendering internal content to zmike. 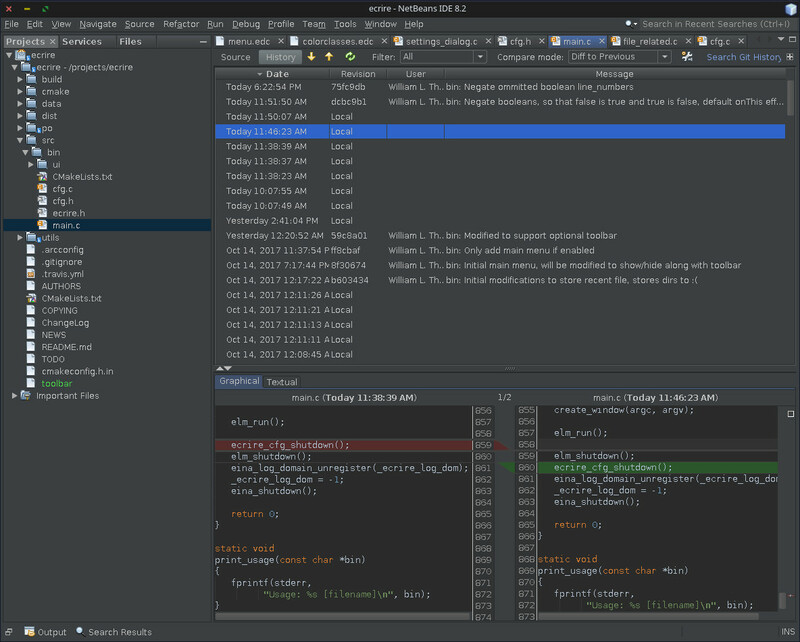 • wltjr created T6143: EFL git messing up theme, maybe theme needs to be updated. • wltjr added a comment to T5815: E not starting "Startup Applications". Still not able to track down issues. It is very sporadic and not consistent. Sometimes it starts every time I log in. Other time is does not start for a few sessions. I am not sure what I can do to debug startup. Seemed to be the same with 0.22.0 alpha, I have not tried beta due to location issues. I see its in the correct location now I will see if that is any better. I had strange gtk non-rendering issues under 0.22.0 alpha. • wltjr added a comment to T6133: Reduce/improve eina_log output. FYI has nothing to do with this bug, but in that entrance output. I determined my issue with that system and dual monitors was lack of specifying an order. I updated the usage for entrance according to such. I had that on one system. On my dual display desktop I never had to set an order. It is likely in part entrance code. Though it seemed to cause major issue for edje, which is what caused other problems in entrance. • wltjr created T6133: Reduce/improve eina_log output. • wltjr added a comment to T6046: e's new sudo password pops up when it should not.. Seems it was a path issue, and it was being invoked twice. Once with messed up path. Thus getting the pop up but it also still working. Strange sudo opens a dialog for a mia file. Maybe has something to do with the pattern matching in the sudoers file. Not being a tty maybe due to it tied to graphical session. Either way resolved. No worries, I am ok with doing unset. But I did test it out with a missing file and seems to cause similar to happen. Seems odd to get a dialog for nothing. Also not sure it should pop up with -A not being used. Even if the env var is set. Thought you needed both, and if no SUDO_ASKPASS set, then it goes with a default or something. Either way resolved for me, can leave this open or close. Not sure if others will run into. FYI I am hitting the window X button to close the dialog. I am not entering in any password etc. I assume if it was part of normal function. Something would fail when not entering a password. It seems to know its not needed. Just the dialog thinks that it is. Not sure what the dialog is returning a status to, etc. @ProhtMeyhet added on 2nd line and no change. Still pops up only on running my 99-synergyc script. The killall does not cause it to pop up. Distro does not patch sudo. Seems to get such you need to use the -A argument with sudo. Not sure it will invoke it normally otherwise, vs a command line prompt for such. Man page confirms the same. As you can see with script I am not using that option. Nor would it be automatic for terminal. That would not make sense, as if it was ask pass then it would fail when I close the dialog. It is not needed. This stuff has been in place for years. Nothing was updated except for EFL and E for a few weeks. I can revert to e 21 and it goes away. FYI it does not come up when using it directly, sudo emerge ... , sudo /etc/init.d/cupsd start, etc. Only seems to come up with that script for some reason. Herald assigned T6046: e's new sudo password pops up when it should not. to zmike. • wltjr closed T6034: E crash on directory preview as Resolved. • wltjr closed T6035: Ability to remove start/main menu from bryce as Invalid. Ah thanks that was it! I thought it would be right clickable like gadgets in shelf. I did not know I had to hold down alt + right click. • wltjr added a comment to T6035: Ability to remove start/main menu from bryce. Is there a combo that will remove the start/main menu? Herald assigned T6035: Ability to remove start/main menu from bryce to zmike. Herald assigned T6034: E crash on directory preview to zmike. • wltjr added a project to T5815: E not starting "Startup Applications": Restricted Project. • wltjr reopened T5815: E not starting "Startup Applications" as "Open". • wltjr added a comment to T5976: EFM crashes E on wayland stable . Is this supposed to be resolved in 0.22-alpha? If so its not for me on my dual display desktop under X. • wltjr added a comment to T5905: create checksums for enlightenment releases. That seems like a justifiable case. Hopefully others will be on board with that. I brought up GPG key signing on edevel list and it was not well received and knocked down. SSH is good enough. I digress, but that was the final call. If things change that would be great, I gpg sign every commit. I fully support gpg signing for releases if not commits, ideally both. Maybe others are open to gpg signing releases. But at that point could just go ahead and gpg sign commits. • wltjr added a comment to T5598: Ability to access recently opened files. Does E have this ability now? I noticed a files configure option. Not sure what that does. Maybe what I am seeking or not. Yes, some users wanted a checksum file with e releases for verification purposes. Seems only EFL gets a manifest at this time. I was not aware at that time it was only done for select things, I think EFL only. • wltjr added a comment to T5389: Update erigo, does not build with EFL 1.18.4 or 1.19.0. I have no idea, but I was told there is no one actively working on erigo. I am not aware of anyone interested in fixing it. Such is the case for many EFL things, I took over a couple. I doubt I will ever have interest in working on erigo. • wltjr added a comment to T1500: New design for Entrance. I have forked entrance. I have done some initial changes to its design. I plan to do a bit more. Eventually making it theme-able again after addressing internationalization and some other issues. Feel free to submit any ideas, requests, patches/PR to the repo on Github. • wltjr added a comment to T3646: entrance hangs on session logout on debian 8. I have forked entrance. I have an open issue on this. I will review your modifications and apply as applicable. Feel free to submit patches or PR if you like. Thanks! • wltjr added a comment to T5520: elm code does not support 3rd mouse button/emulated 3rd for paste. That maybe the case for newer E/EFL, but presently it works in E 0.21.9 and EFL 1.20.3, in anything but elm_code. Seems like a regression or something broke in git if its not working across the board anymore. Herald assigned T5986: Closing EFM crashes E to zmike. • wltjr added a comment to T5800: edi: large text file memory consumption. If ecrire is having issues with files large and small its likely due to changes in EFL. It is possible its in other stuff, ecrire mime handing, setting document title, or other. But basically just does a elm_code_file_open. • wltjr added a comment to T5743: Unwanted line returns added to copied long wrapping lines in terminal output. Great thanks much! I am going to switch to a snapshot of from the 28th. I seem to be hitting another issue with terminology. I do not think its terminology related, but maybe. I think its a bug in EFL. I mentioned on e-develop mailing list. I am experiencing 100% cpu issues from terminology under EFL 1.20.3. I think its EFL but maybe something in terminology not sure. Thus I will see if anything has changed since 1.1.0 release. Any chance of a new release to address this issue? I can use a snapshot if need be, but seems this may effect others. Its a pretty major issue for me as I copy and paste output quite a lot. Thanks! • wltjr closed T5815: E not starting "Startup Applications" as Invalid. This ended up being some odd DM issue. I dropped some code in entrance to fix background issues. Using default e/desktop/background vs some graphic. For what ever reason when I log in now, all the log in stuff is started now. Really odd but great timing! I need to find out how to debug this. I see it trying to start stuff on my laptop. It seems to start things fine on my desktop. Same binaries and mostly same config on both, fun! • wltjr added a comment to T5707: Dual display monitor isssues with resolution and displays being on/off. Sure, I needed to split this into many ticket only reason I left open. I will re-file individual ones as needed. • wltjr closed T5909: automatic mime/syntax support in elm_code on elm_code_file_open as Invalid. • wltjr added a comment to T5909: automatic mime/syntax support in elm_code on elm_code_file_open.